Over Labor Day weekend, the gallery where I work hosts the Outsiders Outside Art Fair, a gathering of untrained, visionary and folk art. As my mother says these artists "have no rules"! Each year I buy one thing. Three years that has meant chicken art. 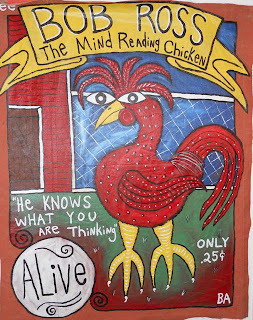 A couple of years later I got this painting from Deb Henderson. Behind the white jar in green letters it says "poop"! 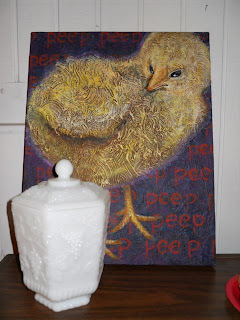 I love the position of the chick's head -- very realistic and so rarely seen in paintings. This little girl watches over my dining table. 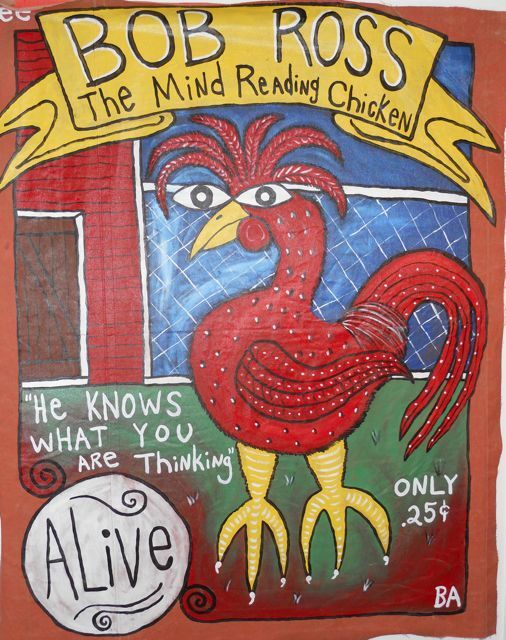 Last year I got this vivid painting from Matt Swenson. 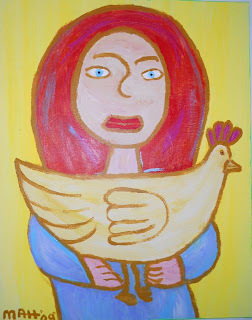 I was determined not to get another chicken painting, but this was so me I couldn't resist! It's right above my television, so I look at it frequently! Isn't it gorgeous?! I love it! And I finally have something on the wall above the bed! I like them all! I bet the sheep with the #'s was a cute one too! Have a great week. Will be out the rest of the week for my big horse show. Will have a lot of catching up to do next week! I used to LOVE watching Bob Ross! It was so cool how he made painting look so easy! 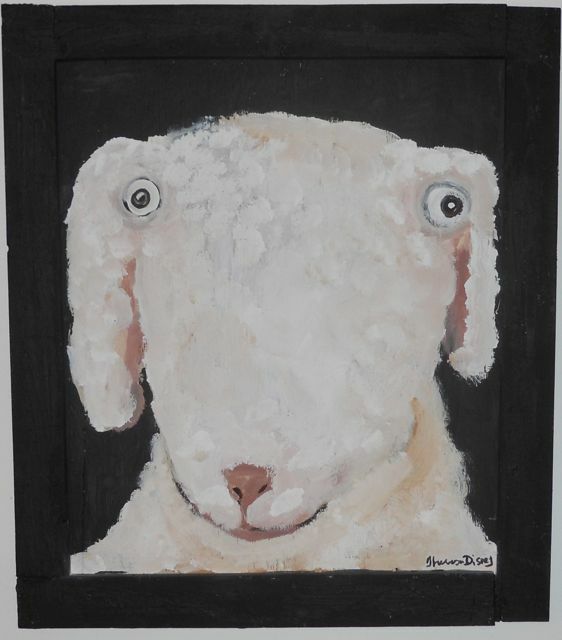 I did a little painting in high school in art class, but I always struggled with right shades and colors. Wierd how a chicken got named after him. 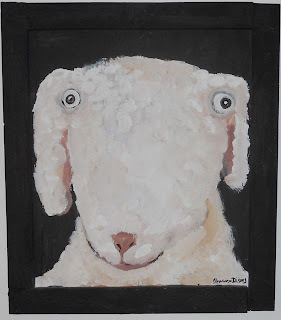 I love all the art but your sheep dog one is the best. That is the sweetest picture. You can see a soul in those eyes! I just LOVE all your chicken stuff! I for one have 175 of them in my kitchen! No joke! One day I will photo my kitchen for you to see. Love this blog! H is for Happy Dogs!